Beyond the every day mythical horses like the unicorn and pegasus, I thought I’d take a look at some stranger and darker horses in mythology. 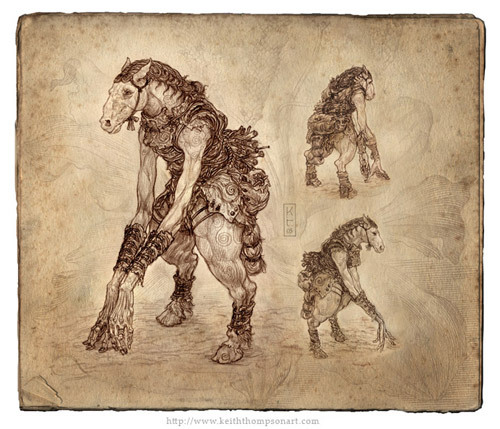 Also called Tigbalang, Tigbalan, or Tikbalan, the Tikbalang is a bony half-man, half-horse humanoid said to roam the rural hinterlands of the Philippine islands. The Tikibalang was quite the trickster and legend has it that he liked to lead outsiders deep into the remote woods of the Philippine mountains. He did this by using his special powers of shape shifting to turn himself into the loved ones of his victims, then leading them into the woods. I put together a description of this creature so you’ll recognize it. Although should you find yourself in the Philippines and you see your grandma in the woods, don’t follow her. The legend says that to get away from this creature you have to wear your shirt inside out. I say, while in the Philippines, wear it inside out anyway, just to be sure. This entry was posted in Horseplay on October 7, 2008 by The Equinest. i love your write-up and drawing. how did you come by this knowledge and what prompts your interest? i have had reports of shape-shifters here but never has anything to do with horses. This is really amazing- love the sketch! Im really interested in mythological creatures of the darker side- especially ones that are less known. Are there more that you know of? hahahaha nice creature.jejejeje nize creazturez. Wow, I never saw this before. You are fascinationg, unbelievable! Thank you! Wow, thats just amazing! And a little bit freaky, scary and VERY disturbing. Nice job!